Medical devices and healthcare equipment are vital to helping people live longer and healthier lives, and globally this market is worth an estimated $340bn every year according to leading operator Smith & Nephew (SN.). As well as developing and manufacturing life-changing and enhancing products, there is also a significant market for helping meet demand for quality care and treatment. 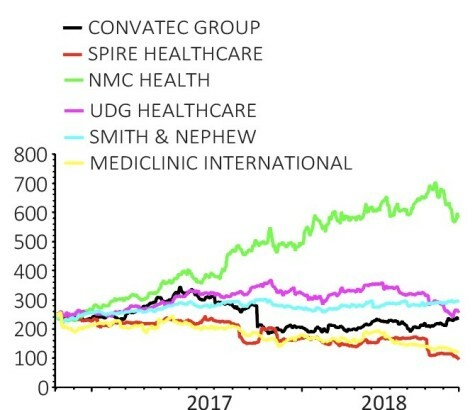 Among the biggest London-listed healthcare equipment and services specialists are ConvaTec (CTEC), Spire Healthcare (SPI), UDG Healthcare (UDG), NMC Health (NMC), Mediclinic (MDC) and Smith & Nephew. In this article, we will explore why the performance among this grouping of stocks has been mixed despite the strong demographic drivers underpinning the space. One of the biggest drivers for the sector is growth in healthcare spending, which is necessary to tackle an ageing population and more lifestyle-related illnesses such as obesity. Global healthcare spending is expected to rise from $9tn in 2014 to $16tn in 2030 and $24tn in 2040 according to a study commissioned by the Bill and Melinda Gates Foundation. Two businesses in the sector have been regularly considered to be takeover targets, namely Smith & Nephew and Spire. Smith & Nephew manufactures advanced wound care products, knee and hip implants, as well as products and technologies that aim to help heal severe fractures. Previous speculation includes interest from US rival Stryker, Medtronic and Johnson & Johnson. In May 2018, Smith & Nephew warned annual sales growth would slow from 3% to 2%, which was blamed on softer market conditions and a weak performance from Advanced Wound Bioactives. While trading has improved since then, the performance has been at best solid rather than spectacular with Berenberg analyst Tom Jones claiming ‘not bad is good’. Jones argues maintaining guidance of 2% to 3% sales growth and margins at 2017 levels will reassure investors as there were concerns new chief executive Namal Nawanda might look to reset expectations. It is fair to say that 2018 has been a difficult year for private hospital provider Spire Healthcare as NHS-related troubles have dragged on trading. Spire recently warned of ‘significantly declining’ NHS admissions, lower than anticipated growth in private admissions and investment in the business, pushing the share price to an all-time low of 138p. 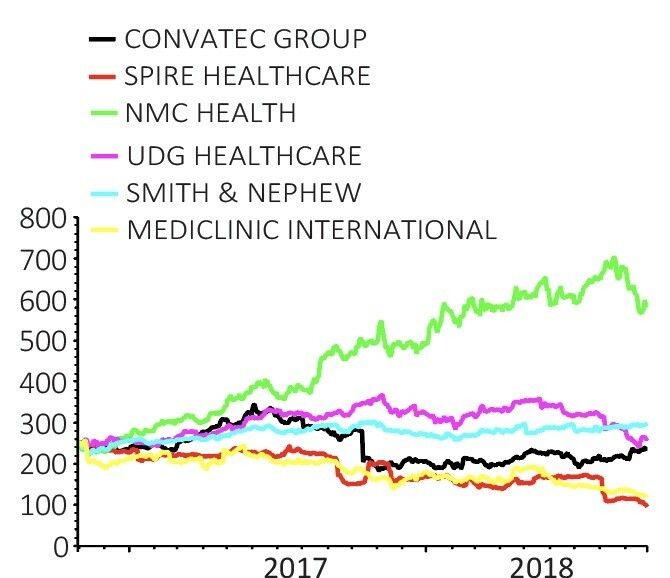 In 2017, the private hospital group rejected a takeover approach from 29.9% shareholder Mediclinic on grounds that it significantly undervalued the business. Liberum’s Graham Doyle is sceptical that Spire’s shares can recover, flagging guidance for annual earnings before interest, tax, depreciation and amortisation was 9% worse than expected at £120m to £125m. He argues if the company was to miss the bottom of its earnings range by 5%, it could breach its debt covenants. Mediclinic itself has struggled of late with investors concerned about problems in its Swiss hospital business where it has taken significant impairments. Rather than a bid target, NMC Health is a consolidator in this space as it continually looks for interesting businesses to take over in a bid to supplement its offering. Recent acquisitions include cosmetics business CosmeSurge and the largest private general hospital in the United Arab Emirates, Al Zahra Hospital. NMC Health is the largest private healthcare company in the United Arab Emirates. In 2017, 70.5% of overall sales were generated through medical services at its network of clinics and hospitals. The company also has a distribution business, representing the remaining 29.5% of sales last year. Through this division, NMC offers over 108,000 products across pharmaceuticals, medical equipment and consumables, consumer, education and veterinary. In June, NMC announced plans to create a new national healthcare company in Saudi Arabia via a joint venture with Hassana Investment, potentially creating one of the largest private operators in the country. Berenberg analyst Charles Weston reckons NMC can more than double sales by 2023 – even without further M&A. UDG Healthcare has an untypical business model compared to the rest of the sector. The Ashfield division focuses on communications, commercial and clinical services, including scientific communication content. It is the biggest contributor of group profitability at 63.1%. UDG also provides contract packaging services such as packaging design and labelling through the Sharp division, generating 31.9% of group profit. Its smallest business, pharmaceutical products distributor Aquilant is being sold to H2 Equity Partners for up to €23m. In August, the company said it would review Ashfield and reshuffle its management team following an underwhelming performance due to the phasing of contracts and a lack of business development opportunities. Since its stock market debut in 2016, ConvaTec has experienced a series of highs and lows as it entered the FTSE 100 only seven weeks after its IPO and beat profit expectations in March 2017. ConvaTec develops medical products, including wound care dressings, colostomy bags and catheters. Its strong performance helped the stock hit an all-time high of 344p, but falling profit, the departure of chief financial officer Nigel Clerkin and slashed annual sales growth guidance in October 2017 amid supply issues, hurt the share price and contributed to the company’s ejection from the FTSE 100.